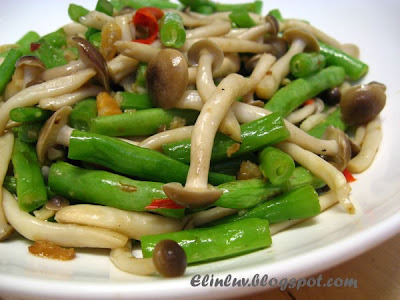 I love veggies and I love all kinds of edible spora, so you can imagine when I stir fry two of my favourites together what would be the reaction from yours truly….imaginable ….happily waiting for dinner to be served! 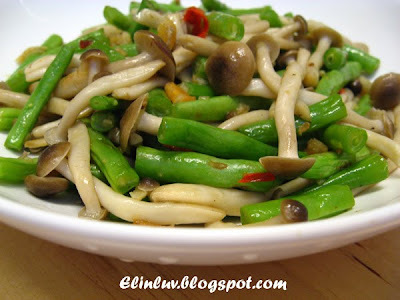 I stir fry french beans and shimeiji with dried shrimps….oohhh the aroma of the fried dried shrimps with garlic and bird’s eye chillies is enough to accelerate the salivary glands into action. This is so simple a dish and yet so deliciously satisfying for the gastro. Heat up the olive oil in a non-stick wok, sauté the dried shrimps , garlic and chillies till fragrant. Add in the french beans and shimeiji and stir fry till cooked, add in thickening and sea salt to taste. Dish up and serve with hot rice.
" Life is too short to stuff a mushroom "
So nice have this with a bowl of rice. Nice pic. Ok, tomorrow will go buy a packet of shimeiji.. my son has yet to try the buttered ones too.. thanks for another new idea, fren..
Do you buy most ingredients from Jusco?? If yes, then make it easier for me. Definitely Iwant to try this dish + the baked chicken. Hi Little Lamb,yup most of the fresh herbs and fresh mushrooms and slamon I get them from Jusco. Jusco has fresh salmon which I love buying from. Slightly pricey but fresh! Mmmmm ... a veggie dish with kick! Yummy! And I love the way you cook the veggies! Simple, quick yet flavourful! 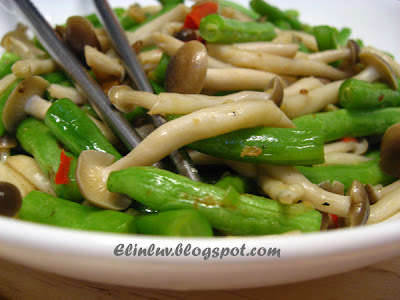 Nice dish to go with rice, 'cheng tim' and healthy. This looks fantastic! I would be in heaven, too, if I was eating this dish. 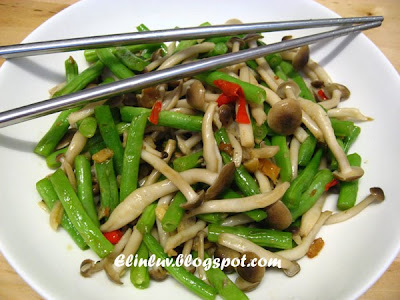 I love to eat stir fried fresh mushroom. So sweet & tasty especially eech/honshimeji mushroom. Really crunchy!!! Those Shimeiji mushrooms are so darn cute. 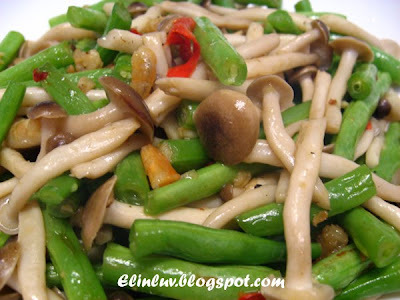 Sound delish with fresh green beans.